A lush vegetative cover to greet you with the warm welcome. A rush for adrenaline as the way to peaks are steeper and full with excitement. A lot to fun on sloppy but risk free snow treks where you can glide, walk and do much without putting your life on stake. Adler and Deodar jungles covered this vale in uphill towards the lake. Even-odd structured snow land flattering ascending hills, meadows are covered with a fluffy snow flex which is dispersing while trekking. The basin of thrilling compound is sited in Uttarakhand’s Joshiman comes under Chamoli district; one of the blessed place in Himalayan trajectory. Out of 13 districts Chamoli is having most precious god-made antiques in Uttarakhand. “Sleeping Beauty” & “Elephant Hill” known as Hathi Parvat is the perfect example of workmanship by nature; it’s spin around on mind like an equipped art piece of sculptor. The trek come out as a teacher because you may get the power of patience; and how to rectify the huddles on the way of trekking. Worm body will gives you the courage to climb, embracing sky high peaks provoke you to be strong & keep chasing attitude. Fog around the peak will reminds you a wizard chanted a spell with his wand. Every step deserve to get captured in beholder’s eyes, it drags you in your beautiful nightmares with drift away feeling and wish it could be never ending time. Local people and guides are too familiar to talking and welcoming, glimpses of cultural splatters replicates to connect their roots and make your mind to be what you are always; cause the love and affection towards worshiped land and the lord is implacable. Badrinath was ‘Katikeyapura’ in Mythology and the reason being this name was ‘Katyuri King’. Alaknanda & Dhauliganga is the heritage for vishnuprayag which stabled in Joshimath; it’s a self-describable word which states for one of the ‘Math’ founded by “Shankaracharya” in 8th century. India’s last village Mana has one entrance gate will come through joshimath, July& August is the best time to visit here. Some mesmerising viewpoints will take your breath away of Dronagiri, Hathi-Gori peak sunset is the most clickable place, bonfire cool down and make that moment cold breezes. Birch (Bhoj Patra used in ancient time as a paper) starts from khullara which measured 8 km from Gulling top. Water streams sounds like harmony in silent jungle. Khullara (2,896m from sea level) is too structured valley; sky high hills keep thrilling you to add more adventure while trekking. Top highest peak is Pangarchulla summit about to 4,700 m above sea level. On the peak you’ll get worshipped stones will be there which symbolize lord Shiva’s presence called “Shivling”. A way of celebrating after reaching at the top trekkers use to enjoy Ice-sliding & fun after a while the view will be visible as clear as Diamond of Nanda Devi(7,816) & Dronagiri(3,610) hilltop. Lord Hanuman’s temple and worship is prohibited in Dronagiri valley folklores explain it with various stories. Hathi Parvat shaped as Elephant and Gori parvat explain the existence of god is the finest artist. Tali lake (3,512 m) Compile the beauty of this trail, hallowed straight from lord’s palm will make this valley more attractive and mysterious cause of mythological facts and evidence still represent that era of King, God and many more. In transit Joshimath, we will take the course of waterway Ganga and cross the popular stream bank. You'll be taken to Joshimath from Dehradun, the street where you'll get the look at various characteristic scenes. The drive from Joshimath to Dhak of around 40 minutes will present you the mountain kingdom encompassing the town. Pay a unique mind to the astounding "Resting Lady" mountain, noticeable obviously from the statures of Joshimath. Towards Gulling at 8990 ft, the situation changes from stark and dusty to green. A thickly forested region kicks in the wake of Gulling and hints of human progress begin to obscure away. The trek proceeds through backwoods cover to the Gulling Top campground at 9600 ft. Crosswise over 0.5 km from Gulling town. Along with this extent, at long last, the sizeable entrancing snow pinnacles of Garhwal Himalayas pop their heads changing the entire vista to a radiant one. From Tali camp, we advance evading the backwoods lands towards the Peak, and somewhere in the range of 40 minutes into the trail, the landscape changes from tree secured shadowy paths to open meadows. In winters, this meadow turns into an exhibition—white snow falling like an excellent cover everywhere to the extent eyes can see. On the way of Tali lake mesmerizing view of Rhododendron & green valley embrace pathway with full of zest. Here you feel 1100 Ft. up from sea level, and which is enough to make you feel the warmth and choosy, throughout the walk you’ll get immense beauty all around with enchanted and glace deed. Sky-line seeming water is lying down precisely the middle of the valley describe tali lake cause it’s beautiful and surprising at the same time, a big alluring lake surrounded by protective and embracing valley seems almost impossible, but Mother Nature is way more up to impossible. Location of the lake is approx 500-600 Ft. above the campsite; lake and rest of the part of valley decorated by Rhododendron and sudden flash view of indulging green meadow. After reaching the hilltop, your eyes will be bonafide evidence view of Nanda Devi, Nanda Gunti, Dronagiri, Chang Bong, Burmal & Pangarchulla Peak. After side-seeing and imbibing flora and fauna up downhill way will send you back to Tali forest camp. Nostalgic moment flood up automatically to leave the place because the memory you’ll leave behind means a lot last day. Trek is not just a sport it gives you courage and teaches you to conquer and sometimes more than that; eventually, it’s all up to you how you’ll take it. Throughout the journey the only thing will be constant that is Mother Nature and its beauty in your mind and soul that have filled you with excitement in the whole Pangarchulla trek. Trekking Pangarchulla, no doubt, is one of the most thrilling adventure ones could ever have in his/her life. With an elegance of nature and unmatchable experience of the pristine mountain ranges, trekking stands out among all the adventures across the world, but nothing comes free, there are certain aspects of the trekking which one needs to consider while he/she is making up his/her mind for trekking. Here’s a list of some basic requirements which one would need during his/her camp trekking. Let’s pay some heed to these requirements for trekking. Three warm layers: On high altitude treks Pangarchulla, temperature after the sunset drops to the considerable degrees. So, during these campsites, you might need an additional layer along with the padded jacket coupled up with a fleece and a warmer. Sun cap: The sun feels brighter and nearer at high altitude treks like Pangarchulla. Used sun caps to save your neck and face from sun Burns, Especially if you are trekking at the end of the day. Trekking on Pangarchulla is a different kind of adventure where you required to be physically and mentally prepared for the best and worse, at the same time. While high altitudes treks making it tough to breathe, the beauty of those pristine mountains leaves you speechless so that you forget to breathe for a moment or two. In addition to the physical and mental preparation, there is a certain aspect of the health that is needed to be considered on the first hand when you make up your mind about the trekking at Pangarchulla. Trekking at Pangarchulla demands endurance and fitness and those who suffer any kind of physical or physiological ailments are advised not to go for high altitude treks in the beginning. To get assurance about the trekker’s fitness, we comply with certain aspects of the being fit such as BMI (Body Mass Index) along with the fitness proof since we can’t put the trekkers into the risk. Monitoring the health is one thing that is conducted regularly during the Pangarchulla by the trek leaders which includes the monitoring of your blood pressure, oxygen level and pulse rate. Details of your health during the trek is maintained in the health card on the regular basis. Health card can be collected from the trek leader at the end of the trek. 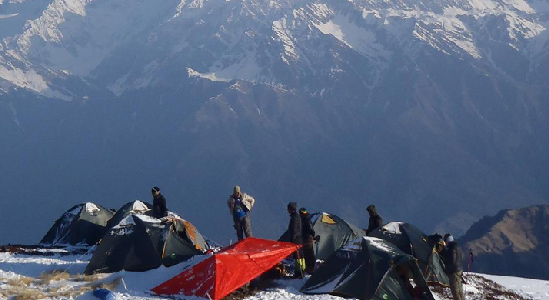 Trekveda provides you all the necessary equipment for trekking at Pangarchulla from tents to ropes. In addition to that, our trek leaders also ensure the safety by various safeguards they take from time to time for your safety. Microspikes are provided to attach to your shoes which help you to keep the traction on the snow and make it easier to climb. An additional gaiter is provided to cover the snows which prevent the entering of snow into the shoes. Customized tents are provided to the trekkers which ensure the warmth and temperature 10 degrees higher than the outside coupled up with high-quality sleeping bags which can endure the temperature up to 15 degree Celsius below the freezing point. Trekveda, keep all your nutritional and hydration requirements on its checklist, our trek leaders will guide you to keep your body hydrated on the high altitudes Pangarchulla as de-hydration can attract to the severe medical emergencies while trekking. Problems like Acute Mountain Sickness can prove fatal at Pangarchulla if not taken into consideration seriously on time. If you face any of the symptoms such as a persistent headache, fatigue or weakness, nausea, dizziness, loss of appetite, difficulty in sleeping, you shouldn’t let it go or treat it by your own either just inform your trek leader. Pangarchulla trek is a difficult trek which is suitable for experts. Who have at least physical and mental conditioning for doing the difficult trek. Trekking at Pangarchulla trek, for its ever-lasting memories and experience, demands just a few things which involve physical endurance with physiological wellness. Not just the one who’s physically fit would do the magic in trekking but one also needs to be mentally fit as well in order to cope up with the adversities one might have to face during the treks such natural calamities, rains or other unforeseen conditions. Getting to the Pangarchulla trek without proper preparation is something you should never do. Cardiovascular exercise is one of the most sought-after methods which provides not just the physical endurance but also the strength to withstand any unavoidable circumstances sternly. 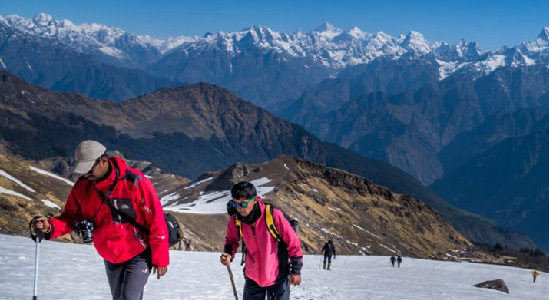 Trekking at Pangarchulla pass trek demands the high endurance which you can develop in few months depending upon your physical condition, where you need to begin with the jogging or running (only if you could do). This practice needs to be combined with the speed and distance targets. You need to keep on increasing both with the time. Begin with a target of completing a distance of 5 km in 35 minutes and then gradually increase it to 7 km in the same time and remain stick to this practice until you are able to cover 10 km in 50-60 minutes without fail, at a stretch. Another vital area of improvement, you need to work upon. Before you head to the Pangarchulla trek, you need to have the physical strength in order to carry backpacks on the uneven terrains. Considering everything under the sun, you ought to prepare yourself for the core strength. A strength would be making you suffer less than others who don’t prepare before it. To pacify yourself or any other companion, yoga and meditation are the keys. These practices not only give you the mental peace but also provide you with a placid inner conscience which is extremely important in order to withstand the cons during the Pangarchulla trek. The trek expense of Rs. 7,999 + 5% GST takes care of all expenses of the trek from Joshimath to Joshimath. 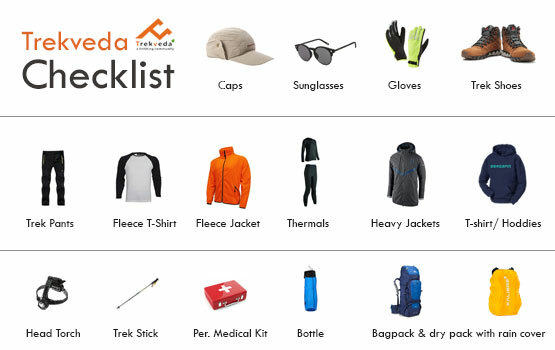 Or if you wish to call off the trek voluntarily at the last moment, in this case the mail requests at cancel@trekveda.com or contatact at +91 7078701964 will be entertained. What is the average Pangarchulla temperature is? The temperature of Panagrchulla trek in winters remains –14° to 18°C. It is usually cold there throughout the year. Hence in order to get yourself not bothered with the temperature all you need is to keep yourself tuned up with the changing temperate. However our trek leaders are the trained professionals who would let you know about the precautions, but packing woolen cloth accordingly is your responsibility. How many days Pangarchulla trek will take? The Basically it’s a 7 day trek which is followed by tour guide but due to any emergencies like heavy rain or snow fall we’ll shuffle the days accordingly. Why Pangarchulla trek is famous? Pangarchulla offers the gorgeous pine forests and maple trees for which this trek is famous, with stunning meadows and streams lining the trail will surprise you with its beauty. What is the height of Pangarchulla Trek? The Pangarchulla height varies with every phase you pass as your approach the Pangarchulla trek, you will acclaim a height of around 3,560 m.
What will be the base camp of Pangarchulla trek? How do we reach Joshimath? Post your arrival at Dehradun and you will be, planning a trip as per the comfort would make your trek easier and you’d not be exhausted before the real thrill. Your accommodation at Joshimath in the beginning and the end at the guest houses where you’d be sharing the rooms with the fellow Trekkers. Food and stay cost is include in your trekking package in Guest house. The stay on the other days will be in the tents which will be provided by the Trekveda. Each tent will be shared by three fellow trekkers however special arrangements can be made on request. A separate tent will be assigned as the toilet room at each campsite. Any additional baggage (without valuables) can be left behind at the Joshimath. Yes, you can take your child on Pangarchulla trek, but the age limit is above 10. The best season to see the snow on Pangarchulla trek is the January and February where you can see a lot of snow-clad you can also witness the fresh snowfall at heights if the climate is favorable but if you’re planning to see the snow at large then the Last week of January and first week of February is best. Mobile network on this trek will be until Basecamp which is Joshimath. After that, there is no network coverage. Pangarchulla trek is considered as Moderate to difficult trek which can be done by anyone, who is fit to trek. Your basecamp Joshimath will be your starting point and ending point will be same. You will get this details while booking of every treks respectively. The sloppy ice treks on Pangarchulla trek make it difficult to walk. You can’t risk taking the preparation for physical strength prior to trek for granted as it may cost you losing your best trek experience. But you can get trekking Shoes and other equipment on rent directly from the marking in Joshimath. Returning to the home with the mystical memories would probably be the best feeling after the trek. Your Trek will end at Joshimath in our guest house, to return you will take a cab from Joshimath to Dehradun. What will be the total expense for a Pangarchulla trek? The total expenses of the trek will be 7,999 INR per person. In addition to that an additional of 5 per cent of the GST will be levied on the total cost. I Really Enjoyed this trek, even though weather worsen on the second day & we had to skip a camp site. Everyone completed the trek and reached the summit before any other group, with the help of our trek leader. Trek was managed and conducted in very good way. Really enjoyed the trek. Trek leader was very good and encouraging and all the staff member were very helpful. One of very good trek to do. I am attending such kind of trek first time and it was awesome experience. Overall rating excellent. Experience of the trek was really good with trek veda. As it was my first trek, I enjoyed a lot. And although the weather was rough we were able to complete the trek without any major difficulties. Overall good experience was very good & very Advensaries.